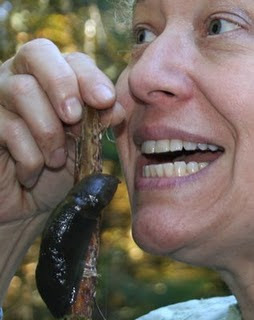 OK, maybe not a banana slug. My photos on my work computer are limited-- we work with what we got. Today's resolution: Explore the sense of taste. Losing weight is in the top three of all resolutions Americans tend to make. But most of us gulp our food so fast we don't even taste what we're eating. Mindful eating offers a chance to slow down and experience our food in an entirely different way. Put your fork down between bites. Notice textures and that big compadre of taste, odor. See if you can identify the six known types of taste sensation: salty, sweet, sour, spicy, bitter and that tricky new one, umami (savory). Notice how the sensations change as you chew, and the food moves from the front to the back of the mouth. Have a taste-off: get three or more samples of one type of food-- say, three species of apples-- and really pay attention to the differences. Plan a meal of very small portions each dedicated to a different taste element. Update: Went to Grassroots Books over my lunch hour to get a new calendar. While I was there I spoke to the owner, the thoughtful Jack Wolcott, and told him about today's blog. He enthused on the importance of slow eating: "It gives your body a chance to ready for the food, know when you're full, and appreciate what you eat". As a result, he notes he makes much better choices about what he eats-- because bad food tastes, well, bad. I told him about eating a piece of local cheese and how much I enjoyed it as I thought about the cow, the dairy farmer, the grasses, the sun-- all that went into what was now going into me. He thought I might appreciate local physician Mary Ann Wallace's new book "Mindful Eating, Mindful Life: How to Change the Habits that Sabotage Your Health." An outcome of the classes she has taught through Heartsprings Wellness, the book includes a CD with journaling and meditation exercises. I am looking forward to reading it. We have such wonderful resources in our community-- check them out.